We are dedicated to serving you fantastic, fresh food and premium coffees and teas. 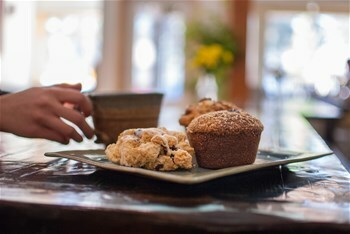 Enjoy a fresh baked muffin, scone, quiche or a breakfast panini and the best cappuccino in town. If you take one of our delectable cookies, cakes or squares with you for your afternoon break, be prepared to share. Meet a friend for lunch and enjoy one of our salads, house made soups, pizza, and fresh or grilled sandwiches. Your gluten free, vegetarian, and vegan companions will find local, fresh offerings to satisfy their desire. We aren't open for dinner, but we can make it easy: fill your grocery bag with house made salad dressings, soup, pesto and hummus. Create an extraordinary meal with our premium ingredients from suppliers both close to home and around the world. We offer professional catering services for functions of all sizes. Whether it's a business meeting, party or picnic we can design a spread that's sure to elevate your event. Eat in or take out. Either way, we look forward to seeing you.